The Biodegradable Products Institute is the current standard in U.S. for composting. 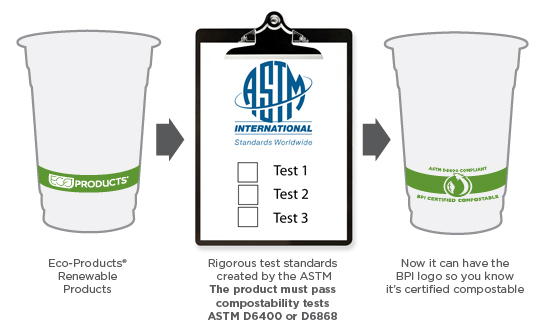 BPI and the US Composting Council uses the American Society for Testing and Materials (ASTM) specifications to certify products as compostable. This specification applies to products made from plastics that are designed to be composted in commercial composting facilities. This specification covers laminated paper, Plant Starch, and sugarcane (bagasse) items that are designed to be composted in commercial composting facilities. Eco-Products® makes sure that our compostable products actually compost like we promise. This all means that if a product claims to be compostable or biodegradable, but does not have a BPI certification, it may not actually be compostable in a commercial facility.